I love the colours that Tracey used, as well as how she placed her pretty flowers. I decided to use Altenew's Beautiful stamp set to make my card. I started off by stamping my flowers as a one-layer card, masking the peonies. from my original card, separately. and adhered the other two flowers over top. The sentiment is from Reverse Confetti's Peacock Pretties. Oh my word those flowers look so real I can almost smell their lovely scent. So pretty! These blooms are gorgeous! Such a lovely card & great take on the Muse. Beautiful flowers, Leigh. I like having some of the flowers popped up. Gorgeous blooms and I love the color combination! The flowers and colors on this are glorious, Leigh! Gorgeous! Love the blooms and pretty colors! Okay, it's all your fault. You have used this set by Altenew now on a few of your recent cards. I had been eyeing it and finally had to have it because of you. I am not responsible. Gorgeous flowers, Leigh. Beautiful card. Wow are these blooms every beautiful! This is stunning Leigh!! Leigh your flowers are just gorgeous, inked perfectly. Thank you for sharing with us at Muse this week! Wonderful take on Tracey's card, Leigh! I like that you cut out the 2 flowers to make your beautiful bouquet! WOW Gorgeous! I really NEED this set! Beautifully done, Leigh! This is a def wow card, such stunning colours...you really have knocked the ball outta the park with this one Leigh. The scale and colour of your blossoms make this one breathtaking card - so pretty! So glad you joined us at Muse this week, Leigh! My jaw is hanging open! This is SO amazing, Leigh! I love this Altenew flower & love how you have used it. Very pretty card. Fabulous take on the Muse. It stands out in the gallery. Gorgeous blooms and vibrant colors. Those flowers are beautifully stamped and arranged. Love the colors, too. Wonderful take on Tracey's inspiration card. 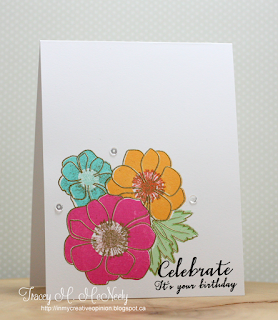 Beautifully coloured flower bloom card - love how you took inspiration from Tracey's colour scheme!